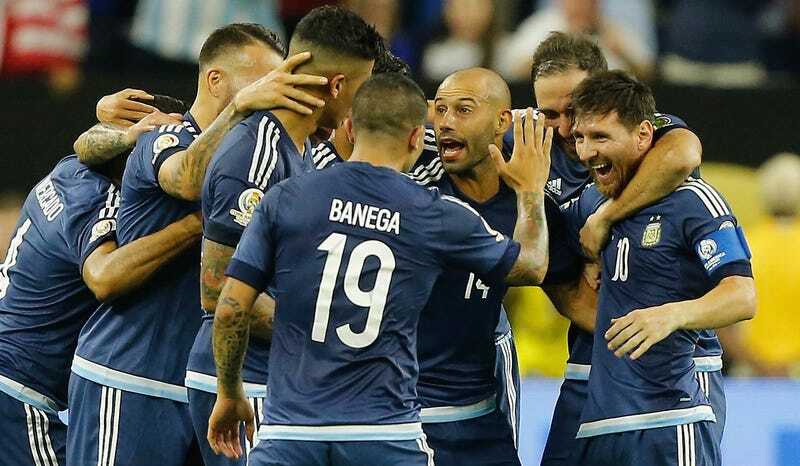 It’s hard to think of an image that better encapsulates the confidence permeating Lionel Messi and—through osmosis, if nothing else—his fellow Argentine teammates than those few moments right before he took that free kick against the U.S. last night. Fresh off being knocked over by a panicky Chris Wondolowski and preparing to stand over the resulting dead ball in an eminently scoreable position, Messi first bent over and studiously reknitted his right boot’s shoelaces. With the chance to officially put what was always going to be a blowout out of reach for good, send his beloved nation and its beleaguered team into its third consecutive tournament final, endear himself once and for all to a country that remains confoundingly unwilling to fully embrace him, and claim Argentina’s all-time leading scoring record, Messi was the picture of calm. There was no pressure evident in his movements. He merely focused on the mundane task of cinching his non-shooting shoe more tightly to his foot so that when it planted for the shot that was soon to come, it would stick there in the grass just how he likes it and allow him to bend the ball toward goal with the accuracy and curve it needed. It’s funny to think about this iteration of Messi and how he differs from older versions—especially this summer, the tenth anniversary of his first major international tournament, the 2006 World Cup. Today, he is Argentina’s serene fulcrum; the undisputed star; the player who orchestrates the entire game as he decides when to speed up play or, more commonly now, slow it down; the one who chooses when to strike the killer blow and when to play a safe pass backward to regroup. Back then he was the heavily-hyped but barely-experienced wonderteen who came off the bench as a final-third specialist. Messi would be sent out onto the pitch to do little more than sprint at and dribble by defenders, all flailing arms and flowing mane flapping in the wind, whipping in shots and pinging out through balls in search of goals scored or assisted. It was a team of big names and even bigger personalities, and though Messi stood off to the periphery (in large part due to his pre-World Cup hamstring injury), it was nonetheless obvious that he was the most electric Argentine on the roster. Ten years later, as the fully-realized historic great many believed he’d one day become, Messi was at his imperious best last night. He thrived in that creator-scorer hybrid role he’s invented over the past couple seasons to maximize the full breadth of his unparalleled and unending skills. He scored the free kick, of course, and also assisted Ezequiel Lavezzi’s opener with a beautiful rainbow chip over the defense, as well as fed Gonzalo Higuaín with a little no-look reverse pass for the game’s final goal. Between those were shots Brad Guzan did well to keep out, runs where he made dribbling the ball while encircled by than no less than four Americans look as effortless as if he were all alone, passes that cut through the whole of the USMNT defense, and simpler short combinations between him and Éver Banega (the only other Argentine who has the same loving relationship with the ball as Messi: both players coax the ball around the pitch with gentle caresses, never wanting it to stray too far out of their sight) that maintained the team’s possession in the exact way the frantic and disjointed American team could not. Messi may still not be quite as comfortable in an Albiceleste shirt as he is in Blaugrana, but he is currently as cool and complete during international games as he’s ever been. He’s at the peak of his powers, and he knows it and shows it. It was good and right for Messi and Argentina to overwhelm the USMNT at something approaching their full capacity, for many of the reasons we laid out earlier today. Specifically, Messi’s displays of greatness against the U.S. and during the Copa América as a whole (he has an insane five goals and four assists in just two starts and two substitute appearances so far) are the exact kind of spectacles of athletic transcendence soccer in America needs. Soccer is still a growing sport in this country, meaning eyes on and appreciation for the game are as necessary—if not more so—for American soccer to get bigger and better as sound tactics and positive tournament showings for the senior national team. We need our future athletes to be cognizant of and enthralled by the best of what the sport has to offer to have any hopes of producing players of that quality. And there’s nothing more revelatory to that end than watching Messi do his thing. I know this from experience. It was young Messi tearing it up in Germany that summer a decade ago that first opened my eyes to what people meant when they called soccer the beautiful game. That World Cup, the next one, following my favorite player from Argentina in the summer to Barcelona in the fall—those were the events and performances that turned me into a soccer obsessive. There’s no doubt that Messi’s even superior exploits this summer, on American soil and against America’s team, will capture the imaginations of even more young fans and potential players, which in turn will redound to the benefit of every American who loves the sport. So for that free kick, and those assists, and that beatdown, and the other shots and passes and dribbles that have awed everyone watching with rapt attention all tournament long, and for what all of that means big picture, American soccer owes Messi a debt of gratitude.